This research was funded by the Department of Environmental Affairs and Tourism (DEAT). Urquhart, Freelance Environmental Consultant, Khanya-‘Managing Rural Change’. Responsibility for any errors remains that of the author. some recommendations for practical action. place a social and economic burden on society. there remain questions over the practical integration of land-use and transport professionals. major upheavals at a metropolitan level in less than 6 years. framework, and either inadequate or uncertain budgetary arrangements at all levels. will to implement. The capacity problem requires focused training interventions. Environmental Impact Assessments, where they exist, are done on an ad-hoc project basis. recapitalisation process is to succeed. local authorities requires clarity, and a long-term budget allocation needs to be made. users in South Africa, resulting in economic inefficiencies and environmental degradation. allocate the money raised to improve alternatives to private vehicle travel, needs clarification. compromised by the lack of institutional restructuring in rail, taxi and bus sectors. developments which contravene policy and this requires urgent attention. more extensive use of user panels. investment in local area networks. in most areas of the sector, but especially where new developments have taken place in policy. research plus carefully targeted international assistance. Sustainable Development to be held in Johannesburg in 2002. Management Act (2000). This background document contributes to that discussion. and recommendations follow in Parts 7 and 8.
orientating the system towards sustainability, there is much work to be done. primarily focused on farming or commercial enterprise, and local rural accessibility is poor. of progress in other areas. 1 Department of Transport (1999) Moving South Africa: the Action Agenda. A 20-year Strategic Framework. C. Urban Transport Policy: A Sustainable Development Tool. Balkema, Rotterdam. interpretation of ‘sustainability’, and in order to provide a full picture. 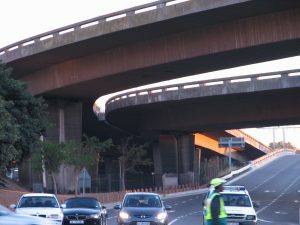 The South African transport system has a high accident rate, typical of developing countries. seen as incidental to the design, despite their abundance. Energy in Southern Africa 8(4). Accidents as Policy Priorities. Habitat International 21(1) 79-89.
and the work of Y von Schirnding at University of Cape Town and the World Health Organisation. 9 Department of Transport (1996) Transport Statistics. Report NSC 18/96. intrusive and can create barriers within urban space as impenetrable as a watercourse. trips per day, compared with almost 3.5 trips per person per day in a high income household. patterns can be affected due to changes in level, patterns, pollution and sedimentation. analysis of subsidy allocations in Cape Town. Africa Annual Transport Conference, 1985. Research Group, University of Cape Town. Publications, London for discussion on this and other, topics. The next section of this report charts the progress in the sector since 1994. Western Cape, the provincial administrations also transferred funds to metropolitan areas. responsibility there was extremely poor co-ordination of operational and planning functions. made without reference to the municipal administrations. markets, and slow to change existing routes, even when over-supply lead to poor utilization. routes and shootings between taxi operators were frequent occurrences. Urban Transport Policy: A review of critical issues and emerging policy principles. Urban Forum 6(2). councils and 7 ‘black’ local authorities. management skills to deal with these, or any other, issues. critical review of progress in the last decade. this section, followed by an overview of key programmes in the sector. the promotion of public transport over car travel in the urban passenger transport sector. sustainable, and minimizes negative side effects (pp.3-5). illustrate the broad support which the transport policy gave to Agenda 21 principles. cycle and represent 25% of the urban population. modes to reorientate urban transport away from private car travel. indicates that there are some internal contradictions, and these are discussed later. also be discussed in detail later in this report. levies and from road tolls. urban transport is still not the domain of elected metropolitan and municipal councils. The mini-taxi fleet is privately operated, partially regulated, and largely outside of the tax net. 27 Buthelezi, P. and E. Maake. National Department of Transport . Environmental Implementation Plan (First Edition). the movement of this policy into legislation, at the expense of significant implementation. end of this section, which charts progress since 1994.
to the Rees Jeffreys Road Fund for Discussion at the New Realism Conference, London, 21 March 1991.
improvements) suggested by the proponents of transport corridors will not materialize. all require a broad interpretation of urban development, and a fresh look at transport planning. Transport Plan called for by NLTTA, and Integrated Development Plans will co-exist. has not taken place, and is now required. provide incentives for efficiency” (p.25). education and training authority and its stakeholders – winning partnerships. South African Transport Conference. 33 NDoT (1998) Financing of Land Transport. Report CR / 98/ 038.
would also have to pay the cost of petrol fuel levies, and this may be unacceptable to them. encourage additional motorised journeys, and rather improves existing accessibility. detailed local implementation plans. The case of toll roads in Pretoria illustrates this. Toll, the nearest alternative route for commuters is 10 kilometres distant from the toll road. human capacity in this area. Environmental Message being driven home successfully? IAIAsa 2000 Conference. discouraged by existing planning systems. slow, with recapitalisation already 18 months behind schedule. building is required in this, as in other, areas. 36 National Land Transport Transition Act (2000). EV9606 for Department of Minerals and Energy: Energy Branch, for more details. 38 See Jakoet, J. and Bester, C.J. (2001) Preparing Public Transport Operators for Tendering: The Western Cape Situation. South Africa Annual Transport Conference. key developments in those areas. mis-managed and hence not achieving their intended aims. and the lack of attention paid to them in legislation and implementation of projects. harmonious development in that industry. Cape Town. Working Paper 2, Urban Transport Research Group, University of Cape Town. This is a matter which requires ongoing monitoring at the construction phase..
essentially ‘business-as-usual’, despite the progressive policy statements. networks based on permissions or tendered contracts (pp.19-20). have poor access to social and economic activity. improvements in transport congestion and environmental impact. next post: CHANGES IN TRANSPORT PLANNING POLICY: CHANGES IN TRANSPORT PLANNING METHODOLOGY?